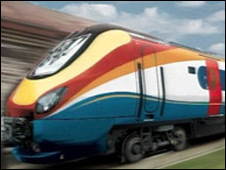 Train times between the East Midlands and London are set to be cut by 20% after a £55m plan was approved. Currently the fastest train makes the journey in 77 minutes but the project to straighten the line could reduce this by 15 minutes. The plans, submitted by Network Rail, have been approved by the Office of Rail Regulation. An additional £5m has also been earmarked to be spent on platform extensions. Improvement works are scheduled to begin in April 2009 following a consultation period that will end in October. Dan Levene, spokesman, from the Office of Rail Regulation said passengers will notice a difference. "Overall, the plan will be good news for passengers. There will be improvements to capacity and reliability which will also speed up services...all things that passengers want." The Head of Regional Transport for the East Midlands Regional Assembly, Barry Davies, believed it was high time the midland mainline saw some investment. "It is vital the East Midlands gets a first class railway. There has been massive investment in the west coast line and substantial investment in the east coast but nothing in the Midlands. "We are slipping behind and need to bring ourselves up to modern standards," he said. Iain Coucher, chief executive of Network Rail said: "Demand for more and better rail services continues to grow. It is vitally important that we get the right level of funding to meet passenger and freight user needs".